How the times have changed! Recently, I realized our favorite homeschool resources page is several years old, and, while some of the items are still favorites, others no longer fit our style or Amber's age. 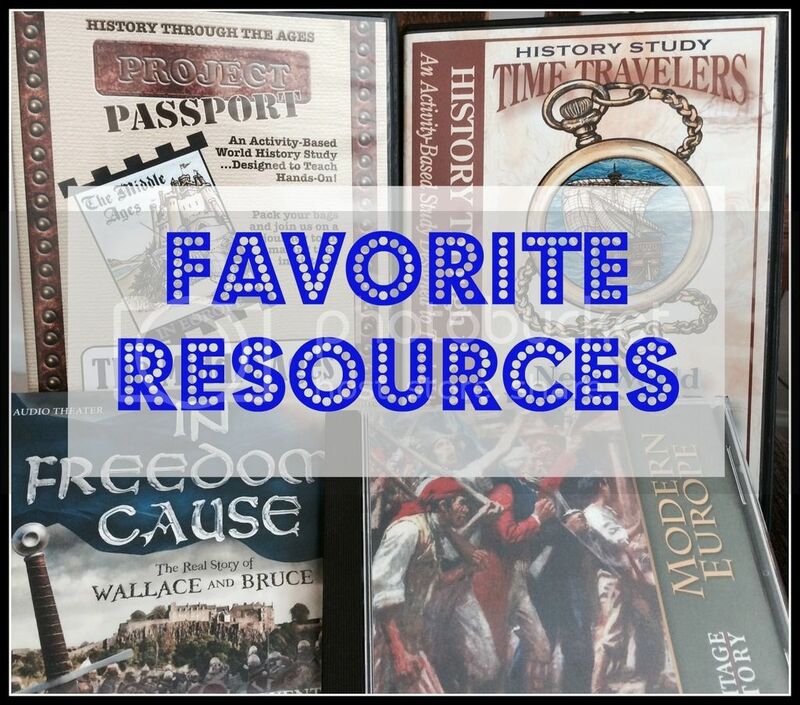 It's time for a new list of favorite homeschooling resources. Homeschooling Blogs - Amber and I both enjoy reading some of the posts from our favorite homeschool bloggers. Not only do they provide encouragement and a sense of community, but also ideas! Oh the number of products we've found because of a blog post, or sometimes simply a way of tweaking our method to better suit Amber. A couple of our favorites with children Amber's age are Angelic Scalliwags and Homegrown Learners. Heritage History - This is our go-to resource for history reading and some literature. The diverse topics and reading ability make this a source we can use for years. We love the portability of their ebooks and the quality of the resources chosen. Homes School in the Woods - I was slow to catch on to their lovely products, but we've caught up now and own almost everything they have created. We don't use it as our primary lesson, but love the timeline, writing prompts, quick history summaries, and project ideas in each product we've used. Homeschool Tracker - This is hands down my favorite lesson planning and tracking software. I've looked around, purchased other smaller products and apps, but nothing fit my needs the same. They've now moved online and can be used from a computer or a tablet. It really fits my style of planning and our way of homeschooling. I love that the lesson plans are independent of the student, school year or school schedule. I can reschedule the lesson for whenever I want in the current school year or postpone it for the next year. Audio Dramas - Who would have thought it could be so successful here? We've adored listening to books we had originally intended to read. These are not just audio books, but complete reinactments of the books. So far we loved In Freedom's Cause and Under Drake's Flag. MapTrek - The easiest way we've found to add geography to our school days is to include it in history. MapTrek fits with most history plans, so no matter which one we're using we can keep our MapTrek geography going. The suggested mapping work varies by age group, which keeps the product relevant every year. Even our TOG Map Aids are made by Knowledge Quest, and appear to be our beloved MapTrek maps simply tailored specifically for Tapestry of Grace. CNN Student News - Until recently we did not purposefully involve current events in our school. Occasionally we discussed a major news item or local news that might affect our daily lives. Now we love our CNN Student News. It gives an age appropriate roundup of world news while still being only a short 10 minutes each day. Crash Course - Whether it's history, science or literature these brief YouTube videos include an amazing amount of detail along with humor that never fails to keep us coming back. We love to use them as supplements to our history and science topics, but sometimes we see something interesting that doesn't relate to our current studies and watch it anyway. Dry Erase Wall - I scoured the Internet looking for the perfect sized dry erase board that would take full advantage of the open space we had. In the end, we decided to repaint Amber's entire study area and turn the open space into a full size dry erase wall. It works like a charm! We use it for math, German, English, quick assignment lists, and even for non-school fun. We've had it for two school years now and can't imagine our day without it.